It’s a pleasure to welcome Sakhumzi Maqubela who is the chairman of what is the first restaurant that opened up on Vilakazi Street. The restaurant is appropriately named after Sakhumzi and today it’s joined by many other restaurants in Vilakazi street. Sakhumzi, thank you so much for speaking to me today. Thank you for calling us and showing interest in Sakhumzi Restaurant’s story. 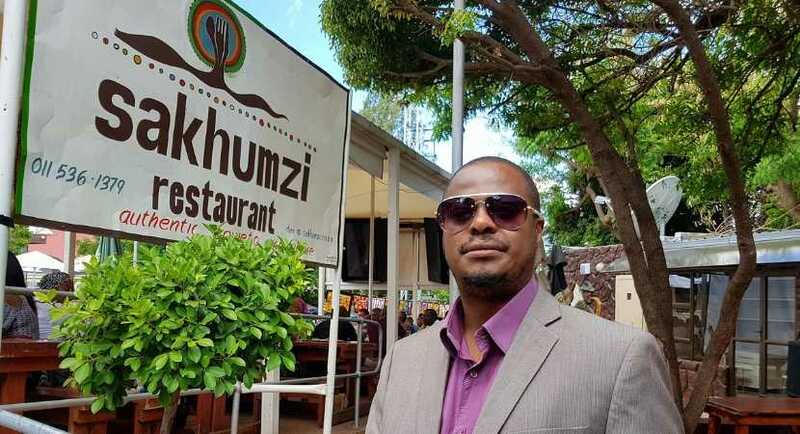 So can you tell me more about the Sakhumzi Restaurant because it opened its doors 18 years ago? Yes, my name is Sakhumzi Maqubela, and I’ve been running Sakhumzi Restaurant in the famous Vilakazi Street, Orlando West since 2001. And you were the first restaurant to open up in Vilakazi street? Yes, I’m the one who started opening a restaurant in Vilakazi Street and now we’ve been followed by 9 more restaurants that have mushroomed, and we have got people also that are selling crafts, and people who are flocking in from Orlando West to come and work in Vilakazi Street. It’s your performers, your DJ’s that normally come and play in our restaurant. So we started with 4 people in 2001. Today we are proud to say we’ve got 110 people that are working on 2 shifts. In terms of indirect jobs we’ve created, we can say we have more than 800 people that work in Vilakazi Street now. So combined with all the other restaurants you’ve then directly created over a 100 jobs? And looking back to when you started, did you ever think that Vilakazi street would become as popular as what it has become? When I drive around in Johannesburg and when I look at your Parkhursts and when I look at your Raleigh Street, I knew that one day this was going to happen [the success of Vilakazi Street]. I used to fix computers and ATM’s when I was a little bit younger and I used to fix them right and I never had to go to work, so I used to sit and do nothing and I would watch tourists passing by in Vilakazi Street where my house is now and which has been turned into a restaurant. When I was reading newspapers back then they would say: “Tourism is growing in South Africa.” Then I thought if I live between the Archbishop Desmond Tutu and the former president Nelson Mandela’s home. His house now is a museum, and we are in the famous Vilakazi street because of Hector Peterson that was shot in the 1976 uprising, I thought if I don’t do this now someone will take an opportunity to start a business in Vilakazi Street. You’ve got a thriving business there now. Who mostly visits your restaurant because, obviously, we know that there are a lot of tourists from overseas who visit Vilakazi Street every day, but I mean is, what is the typical make-up of customer that walk into your restaurant? We are proud to say we have got domestic tourists as well as international tourists. Mostly its people from France, Norway that are coming around lunchtime every day. We see about 200 people on a quiet day, and we can say that locals and tourists, which is domestic tourists and people from other areas, are coming for their birthdays and coming for their reunions. Even during the week, we do have corporate companies that come for their parties, others have quarterly goals when they achieve those goals we see corporate companies coming later in the evenings during the week. That’s why we say we’ve got about 200 people that come to visit us on a quiet day. But on weekends with locals coming we have about 800 people that visit. We are proud to say we are one of the biggest restaurants in Johannesburg. What’s your background story then. You were born in Soweto? That’s a wonderful story. And to celebrate the 18th birthday of your restaurant you are undertaking numerous CSI initiatives. Can you tell us a bit more about that? Yes, we have a soccer club of young boys, aged around 11 to 15 and others 15 to 22. They could be loitering the streets of Soweto but on a Tuesday they are training, on Thursday’s they are training, and on weekends they are playing matches around Soweto. They could be sitting doing nothing after school, smoking nyaope or dagga, but we get them busy during the week and weekends. When they get home, they are tired, so it’s costing us more than R15,000 a month to look after that soccer team, for them to be playing in different areas in Soweto, for them to be wearing their attire, for them to be challenging other teams. We do help out other communities in Soweto as well, like with an old age home, an orphanage home where they need assistance. We are proud to say, this year we’ve got about four people that have graduated, two boys will be engineers. We paid for them at Wits when they started. Today they are graduating as engineers. In fact, last year and today we had two people that graduated as teachers that have started working as well as and the people whom we worked with at Sakhumzi in the last 18 years, we motivated them, we groomed them to go back to school today. They are lawyers, others are engineers. We are proud to say, other people that worked with us, I told them, let them do job rotation as I used to do when I was working for FNB. Today they run their own security companies; others are running their own confectionary companies. So when we look back at what has happened in the last 18 years, we feel proud that we are making a difference in people’s lives. Over the last 18 years you’ve had a massive impact on the society in Soweto — so how do you see the next 18 years panning out? Because we would often see some staff ask for more money (maybe they needed financial support with burying a family member or needed a loan) we then, therefore, decided to start a Sakhumzi stokvel. We’ve seen in Soweto that people struggle to save money and it’s easier when we save together. Now we’ve extended it to Sowetans where we’ve put money together; we’ve managed even to start something where we don’t have to buy all our vegetables at City Deep or at the market. With some of the veggies we’ve started growing them on our own, we now have it every week for free. We’ve got tomatoes, we’ve got butternut, even strawberries that are so nice. We have them on our own because of buying seeds. We buy seeds and we plough our garden that is near the Vaal, so the more money we get, the more we’ll be growing the Sakhumzi brand by having our own training institute to be able to train more Sowetans to make an impact. We’re also focusing on career guidance, where this is lacking in our communities. So, I’m able to guide them and channel them to be able to follow their passion. We’ll be able to train them, so sooner or later we’ll be able to open another Sakhumzi restaurant as well. Sakhumzi Maqubela thank you so much for taking the time to chat to me today. Thank you very much Gareth for inviting us.